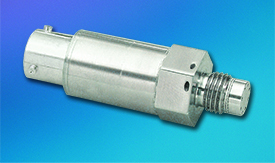 The ETQ-12-375 Series of miniature pressure transducers are flush diaphragm units utilizing a Kulite Piezoresistive Sensor as the sensing element. Mounted within the body of the transducer is a 3 wire system hybrid regulator-amplifier which provides a stable, low noise 5VDC output, with a 12 ± 4 VDC unregulated input. The flush diaphragm is protected against mechanical damage by a screen which is standard.